I try, very hard, not to disturb the milkweed plants which sprout around the yard. This year, I was rewarded by the sight of 4 monarchs. It could have been the two I originally saw back in August, but I tell myself it was four separate butterflies. I would really like to enlarge that area with the rudbeckia and daisies but I need to hire someone to do that. My days of digging up my yard are limited. 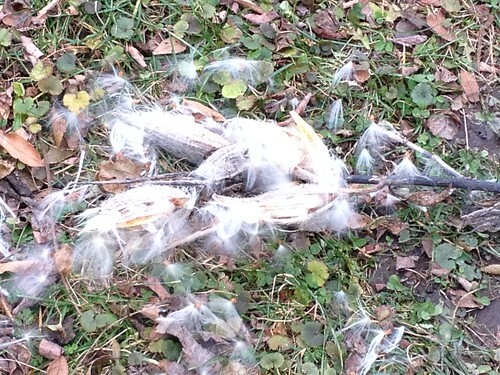 Anyway, the second best thing about milkweed plants is when the seed pods open in the late fall or early winter. The desiccated plants are easy to snap off and the pods pop open with a satisfying 'pook'. It doesn't take much to knock the main stem down and then the seeds are off with the wind. The flight of the seeds is so pretty. A big gust can fill the air with dainty white tendrils. I remember, as a child, popping open the pods and throwing the seeds into the wind. There is something magical about their dance. On this date, the pods had opened and were just hanging around. There was no wind to toss them into the air and carry them around the neighborhood. 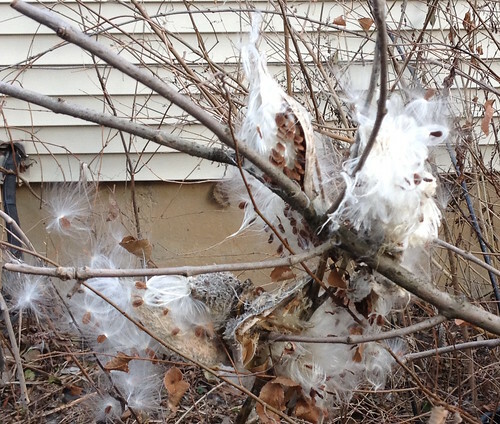 I'm fairly certain my neighbors don't have the same admiration for milkweed that I do and consider it a nuisance. Milkweed needs disturbed ground to settle and sprout but need nothing after that. I'm going to have a lot of the trash trees removed from the back and side yards this spring and part of that is to grind out any stumps to make sure the tree doesn't come back. That's 'disturbing' the ground for sure. There are a couple of places I think would look good planted with flowers, perennials, mostly, which will include more prairie plants. Common milkweed fits that description. I weighed the removal of these volunteer trees and with the detritus of the winter with all the birds which seem to be in my yard now. The birds will hang around and I think, with more flowers to attract bees and butterflies, the overall attractiveness of my yard will remain high. That's the ultimate goal here. Dancing milkweeds and dancing butterflies and dancing birds.